Jamal Roberts looking on as his Mom puts on her signature at Signing Day at ZHS. 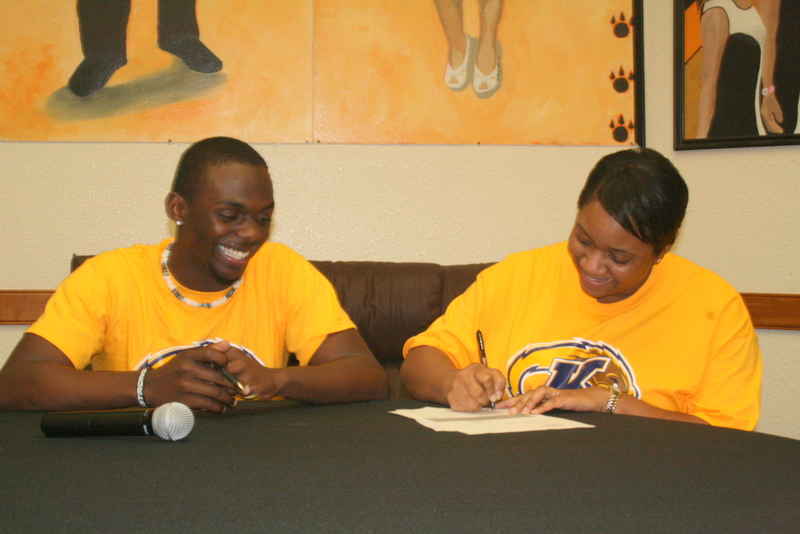 Wednesday, February 1, 2012 will go into the history books of Zephyrhills High School as Bulldog Football favorite Jamal Roberts signed with Kent State in the Commons area at ZHS. This is a proud moment and a testimony to his family, teachers, coaches, fellow players, alumi and the Community. Jamal Roberts, by making the right choices and working hard has landed a position as CB/WR with the Golden Flashes. Jamal has some impressive stats: In 2012 he completed 36 of 61 passes for 542 yards and he rushed 107 times for 1030 yards. In 2011 Jamal led the team in receiving with 605 yards and 6 touchdowns. His awards are to numerous to mention on this blog but you can read about it in your favorite media. In addition on Facebook you can go to ZEPHYRHILLS FREE PRESS and see more photos of the signing. Congratulations Jamal. We are proud of you.